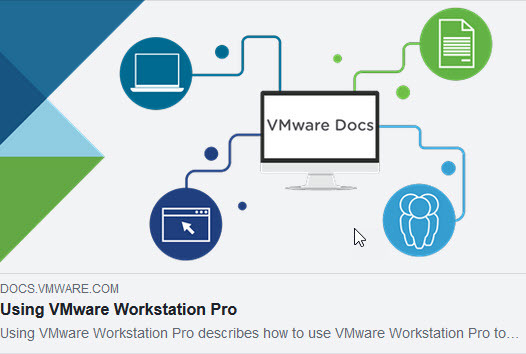 Someone will ask: “Why do you need a VMware workstation? In a moment everything will be clear 🙂 . In the previous post, I showed you how to set up a VPN connection to your home. Today you will see why. To start, a few words of introduction. I have used VMware workstation for many years, probably from version 6.0 and I would never have changed it for anything else. At one time I tried to use Hyper-V, but after trying to configure a network I gave up. Without entering into unnecessary technical details, this solution gives us the opportunity to create virtual machines, or let’s say that it allows you to to run computer on the computer :). If interested, you should read more at VMware or Wikipedia pages. What is worth saying there’s something called VMware workstation player, which is significantly reduced compared to the full version. As we want to create and manage our machines it will not be useful for us. I remember the time when virtualization option was something absolutely new and used by the huge corporation only. And it cost millions. Today I think that for many people, especially IT guys, it is a basic work tool. I honestly can not imagine working without virtual machines. Why you should start using VMware workstation? And many others. Believe me, I tried other Hypervisors and there is nothing better for me! Well, it’s time to explain why this functionality is so useful from the point of view of a person working remotely or a freelancer. Well, each virtual machine can be converted to a shared virtual machine. The whole operation is trivial. We mark the virtual machine that we want to convert, go to Manage, and then press Share. Okay, but why we need all those things? 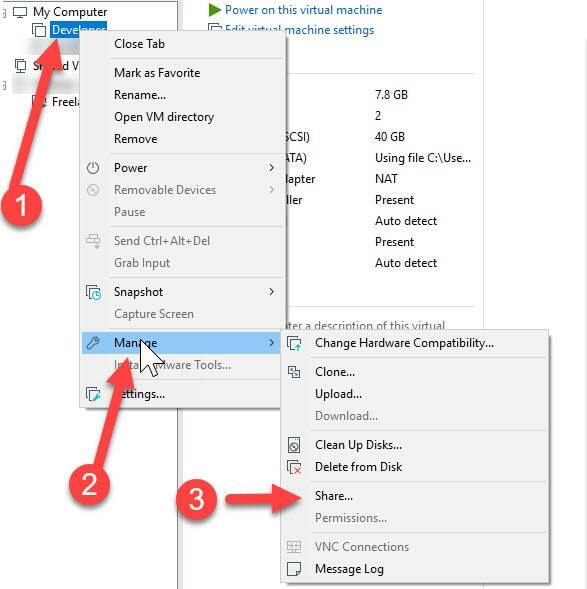 Well, when a virtual machine is shared, you can log in remotely from another computer using another instance of VMware workstation, without having to log in to the host system or use RDP, as the application works in the service mode. This is very convenient because, for example, you log on remotely to the host via RDP, and then to the virtual machine there are often problems with the resolution. What’s more, at the same time another person can work on the computer without even seeing that we are also working. Why we need all those things??? if for someone the answer is not obvious, I am explaining it. Imagine that you are traveling with a light laptop and no hardware frenzy. I write the client that he needs something from yesterday, but this job requires a lot of hardware resources. Zero problem. It’s simple, isn’t it? I recommend trying. I use it non-stop and I can not imagine working without it!